Can a horse and a lion fall in love? This is the “cheeky” through-line of Circus Krone’s newest show Mandana. Celebrating the relationship and collaboration of the company’s directors, horse trainer Jana Mandana Lacey Krone and lion trainer Martin Lacey Jr, this show premiered to a full house in its 5000 seat tent on April 4th, 2019 on the same 4.5 million square foot field that hosts Oktoberfest in Theresienwiese Munich. It was clear from the large press presence that this show was the company’s earnest attempt to generate enthusiasm around their company and redefine their public image. Bringing the production value of a Broadway show to the roots of traditional circus,Mandana celebrates the best of theatrical and traditional styles. Despite its stature and over 100 year legacy, Circus Krone suffers a mixed reputation amongst Europeans. 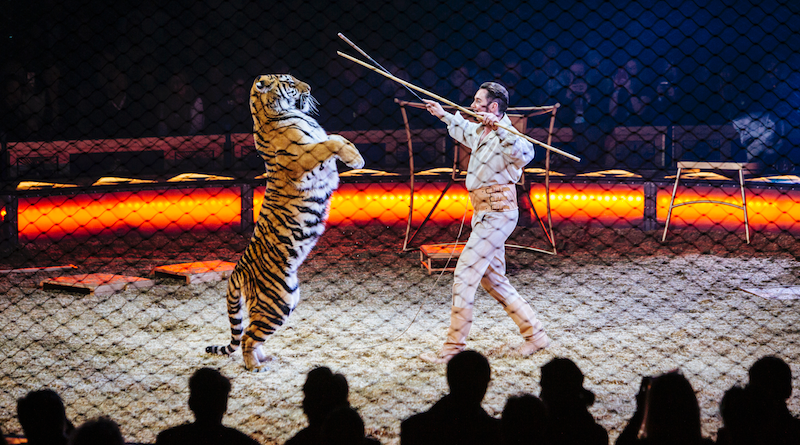 The company is run by animal trainers, and many people object to the company’s use of animals in their shows (Mandana features over 20 horses, 16 lions and tigers, plus zebras, llamas, and camels). One person I spoke to shortly after arriving in Munich said that they found Krone’s past shows “cheesy” and also made mention of Hitler’s use of their venue to give many speeches in the 1920s and 1930s before the original building was destroyed by bombs in 1944. Following the end of Ringling Brothers, Circus Krone is now the largest touring traditional circus in the world, and Krone needed an extraordinary spectacle with cohesive production design to compete with the growing popularity of contemporary circus. Enter Hungarian circus director Bence Vági (Recirquel). Krone sought out Vági to help them with their rebranding after seeing his work at FINA Closing Ceremony in Budapest in 2017. 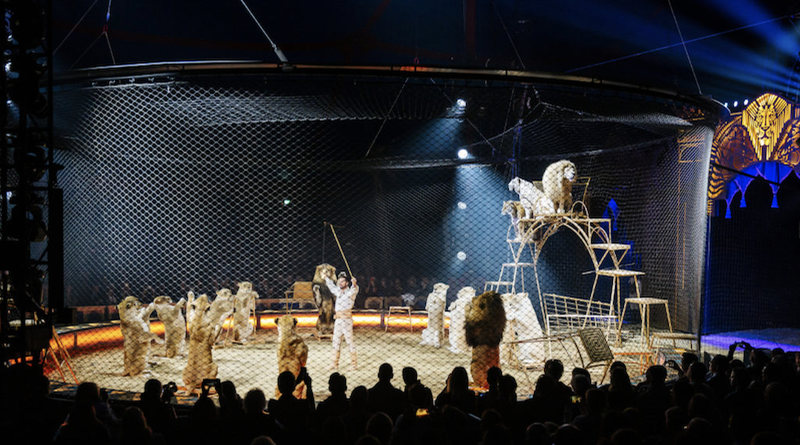 That performance featured over 200 circus artists, a giant puppet and dozens of aerialists on motors at one time– this was the kind of majesty Circus Krone wanted associated with its next project. Beginning with a Baz-Lurhmann style opening number,Mandanafeatures the entire ensemble performing balletic choreography and partner acrobatics, and well over a dozen animals parading alongside elegantly dressed trainers. The stage is set to introduce the show’s loose theme, the implausible romance between a lion (Martin Lacey Jr.) and horse (Jana Mandana Lacey Krone). The lion’s pursuit of the horse, a courtship which had a seemingly unintentional predator/prey undertone to it, becomes a running gag amongst the clowns (Maxin Karpov, Artem, and Konstantin Kopeikin). Ultimately, Martin and Jana shed their anthropomorphic identities and celebrate their love with a wedding dance. If the goal of the circus is to invoke wonder and provide entertainment, then the opening number definitely succeeds. At the same time, I did find myself momentarily distracted by some choices in elements of the costume design and the somewhat gendered narrative. Watching women in leotards with hyper-short skirts designed to highlight their crotches for no reason (this isn’t a nightclub and the men aren’t in similarly objectifying shorts) is surely a traditional aesthetic we can move away from without sabotaging the effort to celebrate tradition’s charming elements. The grandness of the show’s introduction is quickly countered when Steve Eleky enters alone, boisterously in a kilt and tuxedo jacket, for a crowd-pleasing comedic juggling act. The show gets increasingly higher in stakes, next featuring group straps choreography where six aerialists (Splash Duo Amaliia Aranesian and Yegen Splash with Lena Gurtovaya, Sven Munoz,Patrícia Támas, and Támas László)on five sets of straps are lifted and lowered on motors in concert. Next is Eliane and Daniel Stipka performing an acrobatic pas de deux atop two horses trotting side by side, conjured by a coy harlequin character, played by Alexandr Bautev who follows that act with a character-driven contortion routine that is by far one of the most dramaturgically developed acts in the show. At the end of the first half isMandana’s sole representation of racial diversity, Los Robles. 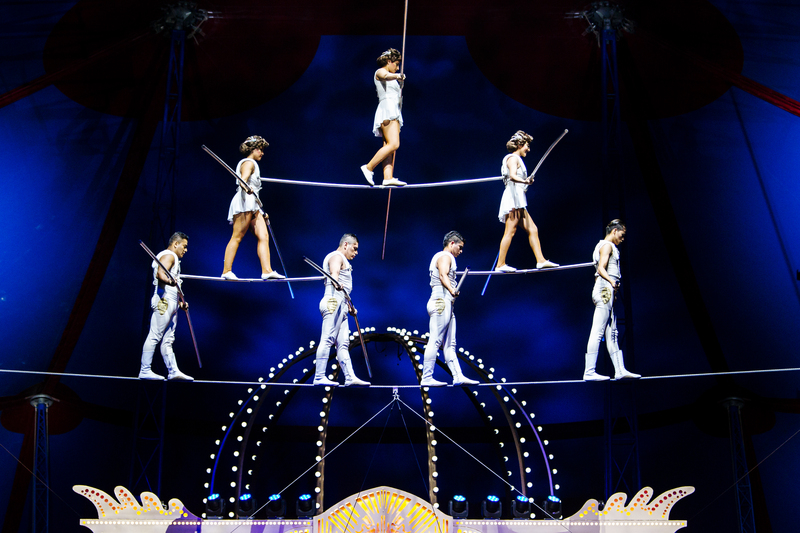 The incredible team runs, dances, and cycles across a highwire, escalating into a six person, three-tiered journey across the tight-rope during which I held my breath despite the apparent ease the performers maintained. The second half of the show boasts a high-energy see-through trampoline wall routine by Non Stop trampoline team, multiple horse acts, and the jaw-dropping Duo Stauberti Perch (Nancy Stauberti and Dimitr Stauberti) whose finale features the base on a unicycle, balancing what must be a 3+ meter pole on his head, on which the flyer does a handstand. Such feats are truly at home in the traditional circus, andMandana does a successful job of balancing the majestic animal acts with similarly breathtaking acrobatic ones. It also is comforting to see safety precautions considered with the use of a safety line for the perch flyer and a giant mat for the tight rope act. The finale of course, is Martin Lacey Jr. with 16 of his lions and tigers. It’s a particularly charming moment to watch a dozen lions pawing at Lacey dangling a string as if they were house-cats. Lacey later told me this is a game he begins with them when they are cubs. Lacey has made a name for himself over the years, as well as earning a Golden Clown at the 43rd annual International Circus Festival in Monte Carlo Festival earlier this year, basing his performance on the distinct personalities of the animals and his loving relationship with them.Lacey’s relationship with the cats resembles the kind between humans and house cats, and it’s clear that these animals trust him when they nuzzle him hello upon his arrival onstage and off (which I was lucky enough to witness backstage). So the work for Vági was twofold: help create a cohesive aesthetic, and highlight the positive treatment of the animals. As much as this show is a concerted effort to be cool, its is also an effort for the company and their work to expand their creative vocabulary and grow their audience base. Sticking with Vági’s idea of a retro feel for the show, Mandanadraws its aesthetic from archived photos and footage of Circus Krone in its initial days of the early twentieth century. Vagi and the production team (led by Gábor Gábriel Farkas) of largely Recirquel collaborators found images from the 20’s and 30’s that inspired the production design, using an over-arching style that created cohesion for a traditional circus show format which can often feel thematically disjointed. The show also featured an original musical score by Edina Mókus Szirtes. 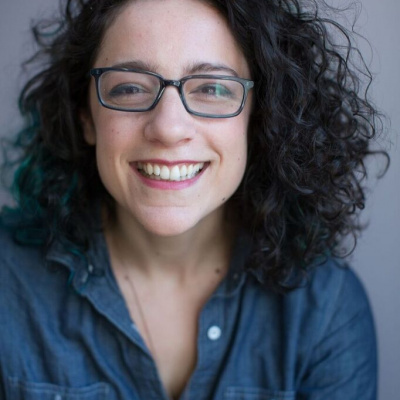 Production manager Aliz Schlecht told me that working on the show from the production side felt more like theatre than circus because of how much communication was necessary between design departments– a dynamic she noted that is less prominent in traditional circus. The performers, who come from traditional circus backgrounds where they might do the same act for well over a decade, were also asked to adapt their acts to new costumes and music forMandana. Vági said that in some cases this was initially uncomfortable for the artists, but ultimately they adapted to the big picture approach of the show. The effect is successful and works to create an elegant atmosphere in which risk is an escalating engine for the acts, and none look out of place in their new attire. It was a lot to take in, and Vági suggested, “Don’t overthink- just have fun!” at the premiere’s afterparty. Part of me wished it were that easy. As Von Borries, “design is never free from responsibility” quote suggests, even a circus cannot separate itself from the influences and histories that surround it. Bridging old with new is no small feat for any field, especially in circus. 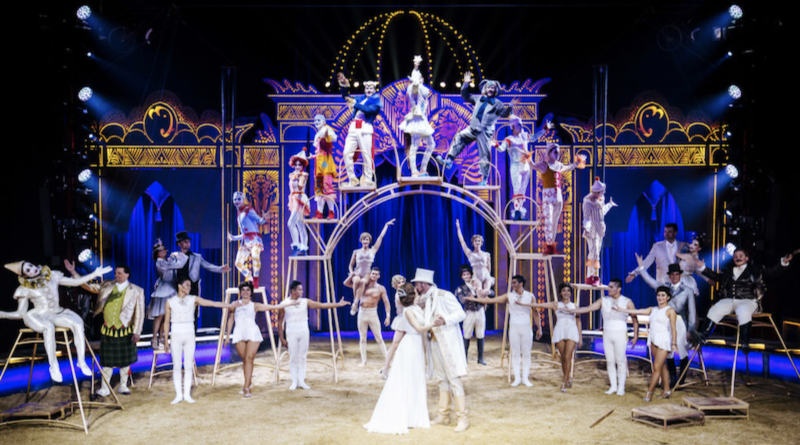 It was a lofty goal of Circus Krone to connect contemporary audiences to their traditional company that still includes animal acts, andMandana is an exciting step in that direction for the company.